At the Northwest corner of San Francisco is Point Lobos. Just South of Point Lobos is Sutro Baths and the Cliff House Restaurant overlooking the Pacific Ocean. The magnificent view from the Cliff House includes the Seal Rocks just offshore. 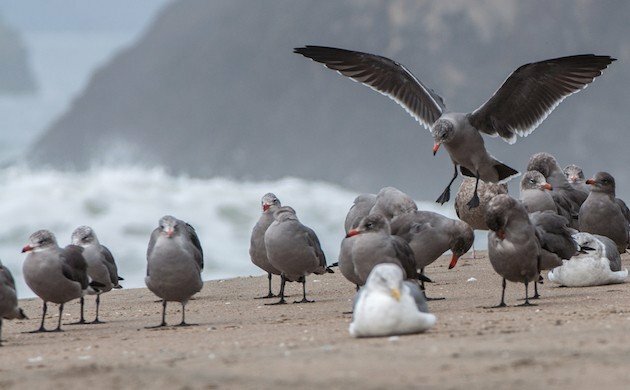 The beach you see below the Cliff House in the photo above (credit Brocken Inaglory, Wikipedia Commons), is where I photographed these Heermann’s Gulls (Larus heermanni). Click on photos for full sized images. 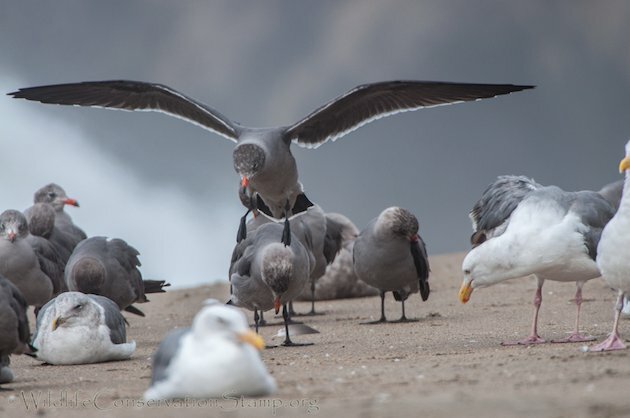 Heermann’s Gulls form large breeding colonies on arid islands in the Gulf of California, Mexico, from March through July. The largest colony exists on Isla Raza, where an estimated 90–95% of the total world population breeds1. Isla Rasa was declared a sanctuary in 1964, and egg-collecting and disturbance during the breeding season are discouraged. With the breeding colony concentrated on one small island this species is vulnerable to a catastrophic weather event. The success of the colony in any one year is dependent on the availability of prey and this is related to the ocean temperature changes brought about by El Niño. These factors have caused the IUCN to rate this bird as “Near Threatened”2. 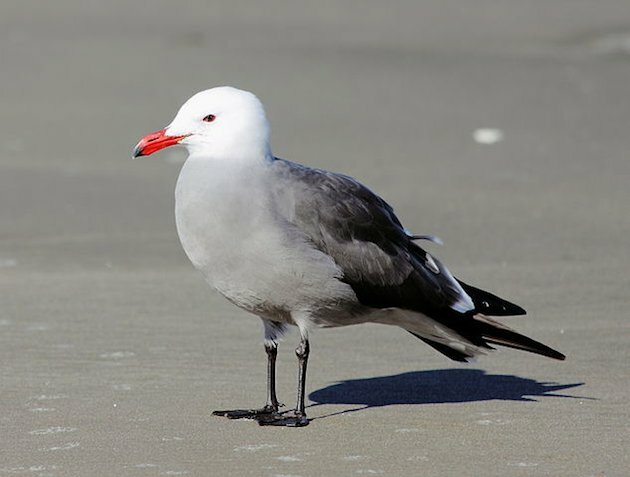 The Heermann’s Gull is also known as the White-headed Gull. This photo by Basar from Wikipedia Commons shows the adult in breeding plumage. 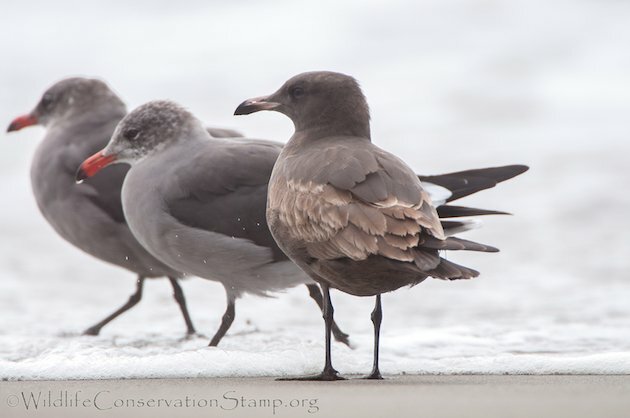 Here are a couple of shots I took of a juvenile Heermann’s Gull on the beach. You know what one of my favorite things is about bird blogging? It’s all of the things I learn about different birds from researching to write posts. If you want to learn a lot about bird species, I find “Birds of North America Online” the best resource on the net. 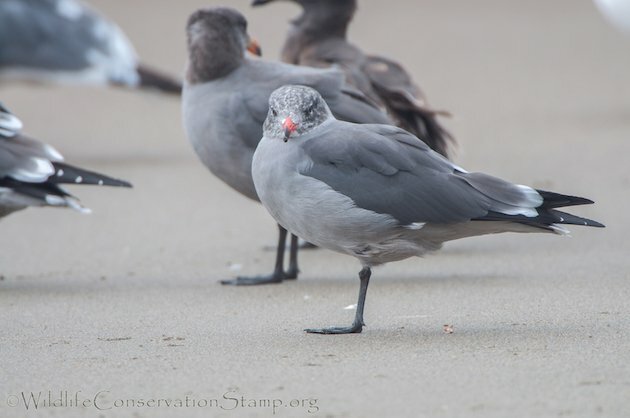 Here’s one last look at the adult Heermann’s Gull landing on the beach in San Francisco. References: 1Birds of North America Online, 2BirdLife International. Yessssss! There definitely had been too few gull posts here lately. Well done, Larry, amazing pictures of a wonderful bird. Thanks Jochen! Unfortunately I don’t get to the coast very often to find coastal seabirds and shorebirds or migrating birds for that matter. I am now back in the Bay Area and visited the same beach yesterday to find not only Heermann’s Gulls but Western Gulls, Great Blue Heron, Snowy Egret, Double-crested Cormorant, Marbled Godwit, Long-billed Curlew, Black Turnstone and Black Oystercatcher. It was fun watching the foraging Curlews trying to keep the Heermann’s Gulls from stealing their hard earned spoils! Great photos, and a very interesting post! 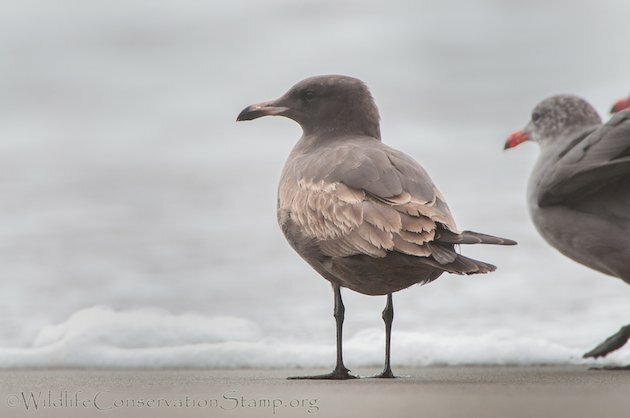 I love this gull, and several Heermann’s Gulls spend their summers where I live on the Olympic Peninsula. I remember one July day a few years ago when hundreds arrived here together and landed on a beach, looking exhausted. 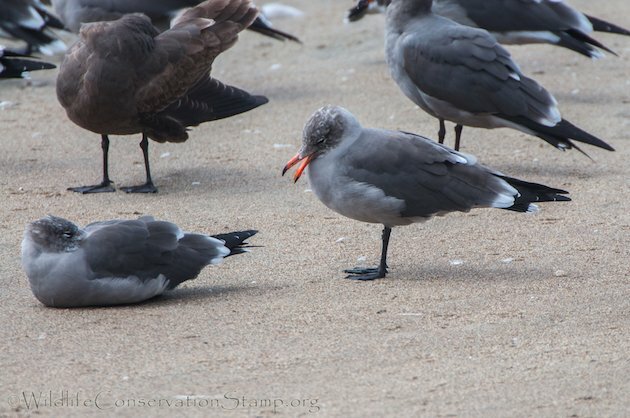 They seem to get along well with our local Glaucous-winged Gulls and Mew Gulls, and enjoy the good summer weather. Then they start to fly south in September, though I still see a few around now. By November they will all be gone. Thank you Wendy. Gulls certainly are fun to observe, photograph and videotape. I think my next West Coast Beat Writer post may include more gull photos, some video and several other shorebirds.. 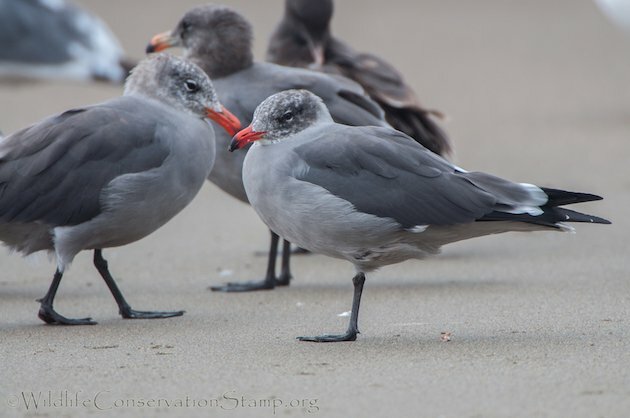 I had no idea that Heermann’s Gulls were so vulnerable. Seeing these gulls on the beach at Playa del Rey is always one of the highlights of visiting Los Angeles (and my daughter). The first time I saw one, I was speechless at it’s beauty.